Front Royal, Virginia: Catholic Church Music Associates, 2003, 217 pp. Mr. Laszlo Dobszay, 69, is a Catholic Hungarian layman who has dedicated his life to the study of liturgy and music. With regard to liturgy specifically, his book is an encompassing critique of the Liturgical Reform of Paul VI. Reading it, one has the pleasant impression of a robust knowledge of Catholic liturgy fluently applied to the concrete situation of our days. With regard to music, he shows the same flexibility: a high level of scholarly formation – he is a member of the Hungarian Academy of Sciences – applied to practice – he is a known conductor of classic and Hungarian music. 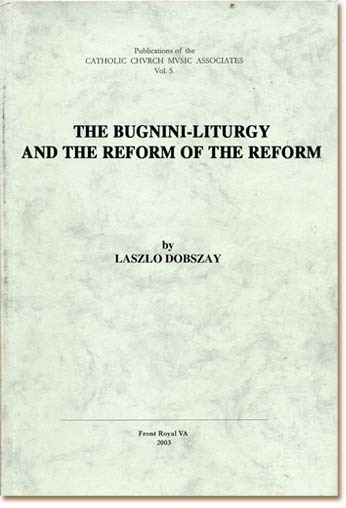 Two streams of thoughts orient Dobszay throughout his book: a meticulous critique of the Liturgical Reform of Paul VI, and an organic interpretation of the progress of liturgy in History. His broad critique of the Liturgical Reform deals not only with the parts and ceremonies of the Mass, but also with the structure of the hours and chant of the Divine Office, the ritual of Holy Week, and the changes introduced in hymns and sacral music. “It is astonishingly audacious to upset a clear liturgical order chiseled by tradition. If somebody anathematizes this ordo for the sake of his own invention, it is near impudence. And it is particularly so if it is qualified as disobedience or unecclesiastical behavior when somebody regards the original order of the Roman liturgy to be clearer, more dignified and worthier to the feast” (p. 39). “The Liturgia horarum took over elements from the Roman Office similarly to someone erecting a new building by using the bricks from a demolished house. But it is not the same building. The structure, material and spirit of the Liturgia horarum stands so far from the Roman Office that it cannot be called a new version of it, a new member of the same family” (p. 68; also pp. 88, 186). With one sentence he evaluates the whole Liturgical Reform: “The truth is that the recent innovations overrode not some 300-year-old custom, but in fact broke with the entire tradition of the Roman Church insofar as it is recognizable for us” (p. 153). These excerpts would seem to place Dobszay among the strongest critics of the Liturgical Reform. One would say, therefore, that a gargantuan combatant against Vatican II’s Revolution has entered the arena. Unfortunately, this is not the case. The Author abhors being considered part of the “regressive forces of reaction” (p. 161), that is, a traditionalist or a conservative (pp. 11, 147-8, 161). At the same time he does not appreciate being termed a progressivist or a modernist (pp. 11, 143). He only feels comfortable in the “middle way” (p. 139). He insistently stresses that his intention is to properly apply the “true spirit” and the “will of the Council” (pp. 135, 139, 164, 180-1, 189) and the text of its liturgical constitution Sacrosanctum Concilium (passim). He intends to “reform the reform,” hence the title of his book, confirmed several times in its pages (pp. 9, 135, 165). There are still other weak points in his approach. Why this exaggeration? Is it just Dobszay’s naïveté that doesn’t see the progressivist role the Cardinal is playing? Is it his “middle of the way” position that feigns to be in the “center” but in fact follows Progressivism? Does he entertain hopes of receiving a Vatican post as a liturgical expert? Is it the habit of a man who has lived under Communism and has learned to always flatter the authority? No precise answer, just a bad impression. * Another strange point is that Dobszay never attributes the Liturgical Reform to its true author, Paul VI. He refuses to consider that throughout his whole pontificate Paul VI worked to achieve and impose the Liturgical Reform. He himself appointed Fr. Annibale Bugnini as secretary of the commission to draft the reform, followed every step of its progress, approved the commission’s final proposal, and imposed it on the whole Church. Finally he rewarded Bugnini by personally consecrating him a Bishop, then granting him the title of Archbishop, and finally naming him Pro-Nuncio in Iran. Dobszay says nothing about all this. Why? It seems a lack of courage to blame Paul VI. The Author criticizes the “dictatorial manner, unparalleled in Church History” in which the Liturgical Reform has been imposed on the entire Catholic Church (pp. 73, 147, 163). He blames only Bugnini’s commission. Doesn’t he realize that a commission of experts doesn’t have power to impose anything on anyone in the Church? The “dictator” was Paul VI and not Bugnini. But the Author refuses to say it. Again, a feeble courage. Dobszay adheres to an “organic vision” of liturgical progress. He states this in many places in his book. What does it mean? In the first centuries of the Church’s life, the liturgy of the Mass was established one way here, another way there. Also various religious families adopted varying forms of the Office chants, as well as hymns, psalmody, and prayers. This organic process reached its apex of differentiation in the Middle Ages, and the Catholic liturgical reality was a rich mosaic. Dobszay is enthused with this organic process, as am I. Then Humanism and the Protestant Revolution entered the picture. Instead of analyzing that heresy and militantly opposing it, Dobszay seems indifferent to it. He only wants to know if any elements in the Protestant sects would “improve” what he considers the organic evolution of liturgy. He admires Protestantism because it “simply continued the development of the late Middle Ages in liturgical chant (as well as in many other matters)” (p. 194). He approves the Protestant “mass” and ceremonies in vernacular (pp. 117, 194). He admires various points of the sects’ liturgies: the “nicely made adaptations” of Gregorian melodies and texts translated from Latin by the Anglicans (pp. 113, 189); the “fashion of some early Lutheran service orders” that would serve as a model for the Catholic Church so each Diocese might choose the songs it prefers (p. 115); the pericopes [selected passages of the Scripture to be read at the mass] that “survived in the Old-Church systems of the Anglican and Lutheran – and early Calvinist – worship” (p. 122); the medieval Entry into Jerusalem ceremony in Advent that “in the Lutheran and Anglican communities remains so even today” (p. 124); “the Salisbury rite of the Episcopal Church, as transformed during centuries of separation” (p. 177-8). In parallel, Dobszay is a harsh critic of the Tridentine Reform. Certainly he admits its continuity with the whole liturgical past of the Church (pp. 21, 23, 56, 68, 153). But he deems that “the Tridentine rite cannot be recommended as the only way to return to the authentic Roman liturgy” (pp. 55-6). He considers its uniformity as opposed to the organic progress. What Dobszay doesn’t realize is that by counter-attacking the different post-medieval heresies, the Church’s liturgy took a new and irreversible course in History. The period of organic process came to an end, replaced by a militant process. The uniformity of the Tridentine Reform was necessary to oppose Protestantism. From then on, this new rampart became a vital part of the Catholic Fortress. An analogous omission is made regarding Progressivism. He reveals no special opposition to the liturgical movement of the 1930s, which introduced Progressivism in the Church. Nothing is said about the progressivist liturgical schema presented at the Council that generated Sacrosanctum Concilium. •	The order to promote urgently a liturgical reform is in SC §§ 1, 14, 25, 31, 40, 43, 50, 63b, 128. •	The encouragement of the participation of the faithful in the liturgy is stated in §§ 11, 14, 18, 19, 21, 27, 41, 53, 114, 121, 124. •	In § 12 communitarian prayer is recommended. •	In § 30 acclamations and dances are advised. •	Inculturation is counseled in §§ 37-40, 112, 119. •	Communion under two species is counseled in §55. •	In §§ 62, 67-82 a complete change in the ceremonies of the sacraments and sacramentals is imposed. •	The reform of Divine Office is decreed in §§ 87-88, 91-93, 97. •	The reform of the liturgical year is ordered in § 107. •	The introduction of liturgical modern art is approved in § 123. •	The suppression of the statues in the churches is recommended in § 125. •	The change of sacerdotal vestments is allowed in §128. An impartial appraisal of the Liturgical Reform of Paul VI shows that it is a direct consequence of Sacrosanctum Concilium. Dobszay, however, finds nothing wrong in this constitution. One can see, therefore, that in practice Dobszay’s supposed organic process of liturgical evolution would appear to be nothing more than a way to conceal Protestantism, Modernism and Progressivism as causes that generated the respective liturgical reforms of St. Pius V, St. Pius X, and Paul VI. The two first, in fact, being very good, and the last one very bad. The ensemble of these omissions indicates that Dobszay is fearful of describing the whole picture. It is my hope that he will review his position in order to please God more than men. At any rate, his book is a useful map that delineates the weak points of the Liturgical Reform and aptly expresses the problem that is growing inside the Conciliar Church: more and more people are seeing its failure, even when they are afraid to analyze its roots.